While in Europe I also took a few days to visit Paris and read The Principle of Individuation: Toward the Development of Human Consciousness, written by one of my favorite Jungian writers, Murray Stein. 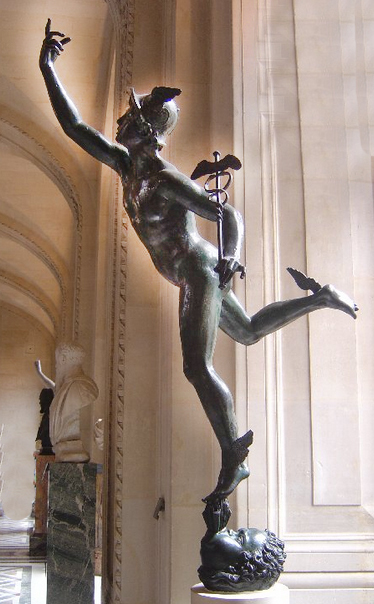 The reading led me to explore the Greek God of Hermes and his archetypal role in transformational processes while all along being inspired by the historical and artistic backdrop of Paris, including a visit to the Louvre with its many representations of ancient Gods. Stein’s exploration of Hermes is especially relevant within the context of understanding individuation—a deeply transformative and developmental psychological process that requires venturing through liminality, the uncertainty of the “in between.” Stein describes Hermes as the God of liminal space and so I was more than a little engaged in his thinking. Stein also applies his insights about the transformative process of individuation to the much larger cultural movements that shape our time, another passion of mine. I found myself very encouraged by his thinking. It is my experience that patterns of change are not just personal, but are also repeated across social scales. Let me step back a bit here for the moment to give you a sense of what lay behind my excitement. My professional focus over the years has largely been about supporting leaders, organizations, communities and others through their journey of change and transformation. My insights into transformational processes draw on contemporary frameworks in organizational and social change and leadership development as well as my anthropological research and experiences with indigenous people, their spiritual traditions and their understanding of change. The Liminal Pathways Framework is a synthesis of these streams, along with the practical insights I have gained from my work with clients and students. Before we look more deeply at the archetypal role of Hermes and why I found it helpful as a doorway for insights into change and transformation, I want to take a moment to appreciate the idea of individuation that Murray Stein writes about. “Individuation” as a concept and process refers to the inherent tendency within all of us to fully embody ourselves and accept all of who we are as our development progresses over a lifetime. This starts with becoming conscious of who and what we actually are. Murray Stein reminds us that the nature of human self-hood and its development toward greater consciousness is a highly complex subject and embraces the great themes of depth psychology. Individuation goes beyond our development as humans through the understood phases that mark it, for example teens, early adulthood, mid and later adulthood and elderhood. This development can occur in quite a self-centered way, reflecting our society’s pervasive and contemporary philosophy of individualism and its assumptions of separateness, competition, etc. Individuation as a goal, understood from the perspective of depth psychology, goes much further. The process of individuation, as experienced and described by Carl Jung and his followers, generates a more transpersonal understanding and conscious exploration of cultural and archetypal dynamics that flow through us and are usually beyond our field of awareness. In fact, individuation defined in this way requires an engagement of our personal and collective unconscious dimensions and the exploration of the numinous, spiritual or mystical dimensions of our experience. Imagination and dream analysis are the kinds of tools used to support this type of exploration. On a personal level these approaches can help us resolve dynamics that have kept our energy lodged in the past. These resolution can open up great avenues of access to our vitality, creative, curiosity, perseverance, etc. On a collective level the process of individuation requires recognizing that personal experience is based on patterns much bigger than ourselves and that the question about who we are and what is ours to do is intimately linked to exploring these collective patterns—personal, familial, cultural, religious, etc. Jung refers to these collective patterns as archetypes. In Jungian psychology, the psychological tradition of Stein, archetypes are collectively-inherited unconscious ideas, patterns or thoughts, images, etc., that are universally present. Many who are inspired by this line of thinking have come to believe that understanding how archetypes work within us and how to work with them is an integral part of becoming a conscious and individuated human being. This brings us back to the archetype of Hermes. 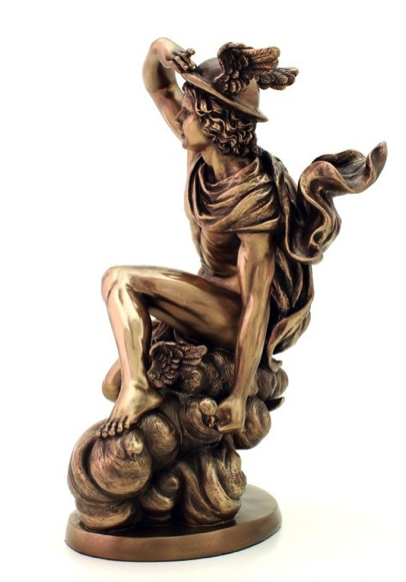 Hermes is one of the oldest of the Greek Gods and known as servant and messenger of sky god Zeus and travels across the boundaries of this world and the world of the gods. He marks the threshold between this world and what lies beyond it. To understand an archetype it is useful not only to understand its function but also to understand its characteristics and energetic presence. These can teach us something about how to consciously work with an archetype. Hermes is characterized as swift and winged, as a thief and bandit, inventor of pipes and lyre, and a guide of souls and god of dreams and sleep. In the Homeric Hymn, he is a lighthearted trickster, in a way amoral, and for some he is known as a magician. Other attributes include that he is a handsome young man of ideal physical build, extroverted in attitude, rhetorically gifted, enchanting and seductive, ready to serve but not to take advantage of, friendly but independent, inventive, intelligent, athletic and stealthy. For example, we can ask ourselves, what if any of these Hermetic qualities do I need more or less of in my own inner development right now? If I am ready to push forward and break though a limit in my sense of self in what ways would be the mercurial energy of a trickster be helpful? Murray Stein describes Hermes as not being at the center of politics, decision-making or action taking involving power. Rather, Hermes is an edge-person who moves at and across borders. He is on the periphery and boundary is his home. Essentially he is located in liminal space. This archetype is present, for instance, when we find ourselves at a crossroad that is forcing us to make a choice or when we encounter a boundary that limits our movement. While we might have been comfortable inside the familiar constraints on the road we have traveled so far, there is now a new urgency to go beyond the familiar. We might have real trepidations about this but at the same time we feel excited by the possibility. Recognizing that this feeling touches into a common pattern—an archetype—and that a transformative experience may be afoot, can be very helpful in making this crossing. Understanding Hermes, recognizing his presence, and working with his energy can open a new door and encourage us to embrace liminal space. Liminality comes from the Greek word limen and means threshold and margin. Liminality is the phase in a transition process where we are no longer the old and not yet the new. It is the place of great tension—that is both challenging and generative. In our current work at The Grove with designing and leading change, we assert that understanding the dynamics of the liminal space is an important skill of anyone supporting the change process of another, especially if the change is intended to be transformational. Transformational change, by definition, happens at the deeper levels of self or identity. For organizational or larger systems transformational change occurs on a cultural level, including changes in values and behavioral norms, etc. and this requires moving through ambiguous, liminal places as a collective. As I continued to explore the idea of Hermes helping with transformational change, I discovered that in Greek folk religion Hermes was associated with the boundary markers that dotted the Greek landscape. When a wayfarer came upon a heap of stones that marked the road and found an offering that was placed there before by another, the wayfarer would associate this as a sign that Hermes was present and gifting him on his journey. But these stone heaps also might have marked a grave, and perhaps a body lay beneath. So the Hermes archetype appears not only at the horizontal crossing but also the vertical three-dimensional crossroads between this world and the underworld. He is at the gate not only of the unknown in this world but also the unknown of the unconscious. But he is not a gatekeeper. He simply represents conscious awareness and acceptance of the energy of the boundary, the crossroad and of the space that lies beyond it. From a psychological perspective, Murray Stein notes that Hermes helps us notice the boundaries of consciousness and tap into our motivation to expand our consciousness at these crossing points. Our appetite for exploration grows. New spaces, actual or psychological, invite bold and courageous travelers across the new boundaries and into uncharted territories. Hermes calls attention to the space being left and the space being entered. So, humans can call upon Hermes. We can actively work with his characteristics through active imagination to create new possibility in our consciousness, and cross new edges and boundaries beyond which lies the mysterious, the unknown, the potential—the mysterious ‘other.’ Imagine yourself as Hermes. Who holds Hermes energy in your life? What is your relationship with this liminal god, this trickster, this ‘amoral’ force, that has the youthful energy of the puer? When does he “show up?” How can he help you recognize the space you are in and leaving behind, giving you courage to cross the boundary and open doors into the unknown? It may have been the city of Paris, or perhaps these amazing statues, but Stein’s descriptions of Hermes came alive for me as an active idea. I sense Hermes has something new to show me and that understanding this archetype might also be helpful to others who consider themselves agents of change. Murray Stein, as a depth psychologist and therapist, writes about the role Hermes plays in the therapeutic encounter where the therapist is supporting the client in the process of individuation. But isn’t Hermes also active in any relationship where one is supporting the transformation process of another? And is Hermes not also present in the work we consultants are asked to do with leaders and their organization and the people that work within it? I have always found that insights from one discipline or school of thought, in this case depth psychology and Greek mythology, can be very illuminating for the work we do in another. Maybe crossing real borders as part of my travels or my fascination with intercultural and multidisciplinary thinking is calling in Hermes. I suspect that Hermes is inviting me to take a deeper dive into our western cultural tradition and its archaic roots. What can our western cultural tradition and Hermes tell us about the challenges we encounter as we do the sometimes very hard but important work of change? And going a step further, what liminal spaces do we need to enter as a culture to transform in response to the challenges of our time and in what ways can Hermes be helpful in stepping through the doorway of change? I love this post and the evocative “calling” of Hermes you have created here… thank you! One thing you didn’t focus on explicitly in your writing is that Hermes is a messenger – running communications back and forth between humans and the Gods. This feels particularly relevant when we think about the way we as humans are able to communicate (or not) about liminality, especially in the collective contexts you noted as so important right now. What I find most fascinating in relation to all this is about the kinds of language/s we need to learn now – to illuminate our own experiences within this liminal moment in human history, and/or help others through the portals and passages that are opening all around us now. Or, put a different way, what are the (fundamentally spiritual) communications that can be heard and understood in the (essentially secular) culture most of us find ourselves in?